Along with scaling capacities, the Bitcoin SV ecosystem continues to grow at a rapid pace. In our weekly post, we provide a summary of some of the past week’s developments from around the world. eSport and Bitcoin make a natural combination, so a shout-out to hivr for using the opportunity to push adoption in Thailand! Working together across the world, we are bringing the Satoshi Vision to life — to create the world’s new money and the global public ledger for the world’s enterprises. Considered one of the top Bitcoin wallets because of its strong technical feature set, key developers from the Electrum wallet project (and its spin-off Electron Cash for BCH) have released a BSV version in the form of ElectrumSV. Given that there are already strong BSV mobile wallets, ElectrumSV will focus on being a desktop wallet. Version 1.0.0 is available for download at electrumsv.io, and is provided for free usage under the open-source MIT license. ElectrumSV is supported by the bComm Association and nChain. Read the bComm Association’s official announcement here. –​Deep wallet (internals) redesign, moving away from SPV. –​Drastic reduction of recovery time – from minutes to seconds. –​The update will automatically restore your wallet so everything is migrated to the new structure, it will just take a few seconds. We value the coins in our ecosystem and we want to also share the good news that historical features and more exchange options are coming to the application very soon making it easier for users to interact with your coin. 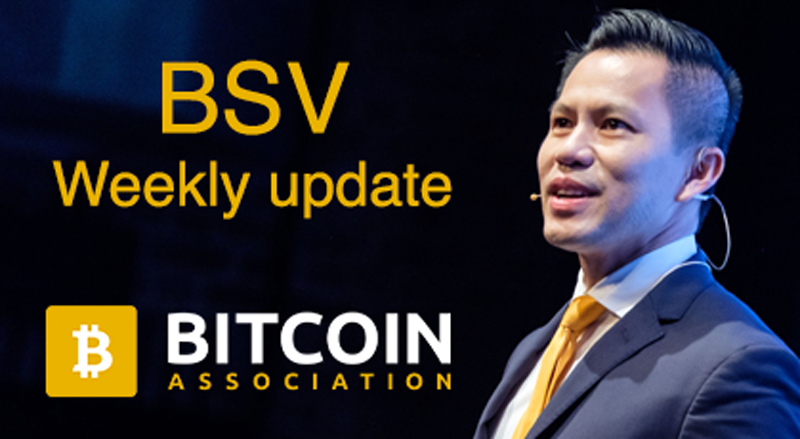 Exchanges are a useful on-ramp service that enables users to purchase and trade BSV, which they can then use to facilitate transactions on the BSV blockchain that benefit their everyday lives. More than 70 exchanges now list BSV, including some of the biggest global exchange services such as Binance, Bitcoin.de, or ShapeShift.io. Last week’s new entry is from SideShift.ai. Similar in function to the exchange service ShapeShift.io, SideShift allows users to exchange other cryptocurrencies for BSV, without some of the requirements needed to register for a fiat-to-cryptocurrency exchange. To see all major exchanges that list BSV, visit CoinMarketCap or CoinGecko. Our new monitor is now live! We can process the 103 MB block in about 40 seconds instead of 1 hour. In theory we can go up to about ~ 1 GB blocks without user experience being impacted. Do we have any remaining scaling issues? Bring on the next stress test! BitIndex API is now public for #Bitcoin #SatoshiVision developers. Build your app faster and spend less time managing UTXOs and Wallets for Bitcoin. Real-time UTXO database, manage wallets (XPUB suppport) and blockchain API. Bitcoin SV Payments for WooCommerce is a Wordpress plugin that allows you to accept payments in Bitcoin SV for physical and digital products at your WooCommerce-powered store.